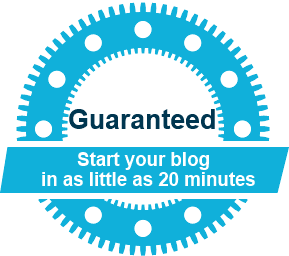 The entire process of getting your blog setup and ready should only take you about 20 minutes. After that your blog will be online and ready for you to start blogging! 1. Pick a domain name. Good blog names are unique and descriptive, so your audience will immediately know what your blog is about. Another option is to simply use your own name. For example, I have registered scottchow.com. You can also add your middle name or middle initial if you find your name is already taken. Many of the top bloggers use their own name as their domain name. This has the added benefit of preventing someone else from registering your name, allowing you to secure your “virtual real estate”. .com is the gold standard, but .net and .org work just as well. I would suggest staying away from other extensions like .us or .biz, as they are not as familiar to most people. You may find that the domain name you want is already taken. This happens to all of us. In fact, it happened to me with this site. Blogstarter.com was already taken, so instead, I chose theblogstarter.com. If you find that your desired name is already taken you can try adding simple words like “the”, “a”, or “my” to the beginning of the name, or you can try adding dashes between words such as the-blog-starter.com. 2. Choose a web host. A web host is a company that stores all of the files for your blog and delivers them to the user when they type in your domain name. You must have a web host in order to have a blog. Choosing a bad host will doom your blog from the beginning. Users will be frustrated with slow page loading times and you may often find that your blog is simply not working at all (yikes!). They offer a free, simple installation of all the popular blogging tools, including WordPress (the one I recommend and show you how to use in this guide). They have been recommended by WordPress since 2005 and currently host over 2 million websites. They offer industry leading 24/7 customer service via phone, email, or web chat. They offer a money-back guarantee if you are unsatisfied for any reason. Because BlueHost is a top-quality web host they cost a bit more ($5.99 per month) than low-quality hosts. There is a way to get a discount though. If you use one of the links on this site you can get BlueHost’s high-quality service for just $2.75 per month (for 36 months), including a free domain name. Disclosure: When you use these discount links BlueHost compensates me, so all of my help is free of charge to you! Click on the next step for a complete step-by-step walk-through of how to register your domain name and setup your blog. If you have any issues during this process you can always contact me for free help. In fact, if you have any trouble at all creating your blog with this tutorial, just contact me and I will do it for you. BlueHost compensates me when you purchase through my link, so my services are free of charge to you!